This article is to provide our readers with general information about the Hoover Floor to Floor Cleaning solution and advise our readers that there is a newer version of this product from Hoover. The new product version is Hoover Hard Floor Cleaning detergent. We will address our own review of the newer version. We decided to test and evaluate the newer version because usually manufacturers’ newer versions of products eventually discontinue older product versions. What we discovered was that the Hoover Hard Floor Cleaning Detergent did a good job of cleaning hard floor surfaces. We evaluated it on vinyl tiles, ceramic tiles, laminate vinyl floors and marble tiles. We used the product in a Hoover FloorMate SpinScrub Scrubber, Model # FH40010. The results were positive using a FloorMate SpinScrub Scrubber on all the hard floor surfaces we tested the product. We noticed that it had a wonderful clean scent as we cleaned the various types of flooring. We also noticed that the product had moderate foaming which was mostly because of the scrubbing action of the brushes of the FloorMate. However, the foam levels were not that high that it was difficult to remove. The FloorMate also picks up the solution as it scrubs and the foam levels were not an issue. As we tested the product we paid close attention to the product’s claim of leaving the floors clean without dulling the floor or leaving a sticking soap residue. This product lived up to its claim of not leaving a soap film on the floor. Based on the analysis from the total evaluation, Keepingfloorsclean.com would recommend this cleaning product to the residential marketplace. Note: The following product description and product information came directly from the Hoover Website. This is the newer version of the Floor to Floor Cleaner for Floormate Hoover machines. 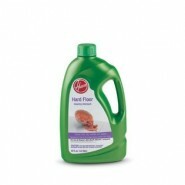 Product Name: Hard Floor Cleaning Detergent 48 oz. General Product Information: Specially formulated detergent designed to clean all sealed hard floor surfaces including: marble, tile, wood, vinyl, laminate, granite and acrylic flooring. Gently removes everyday dirt and grime to make floors shine like new. Ideal for use with all Hoover extraction machines. Note: Bissell® is a registered trademark of Bissell Home Care Products, Ltd. Bissell Home Care Products, Ltd. Does not manufacture of distribute this product.